Star Wars is an old, yet long-lasting franchise which loved by tons, tons of fans around the world. Most of us still anticipated the new Star Wars title called Star Wars The Last Jedi just released recently on December 15th 2017 despite that Star Wars Battlefront II fiasco. Interesting enough, this new sequel has received lots of controversial opinions from viewers and Star Wars fans. And so today, let’s have a Star Wars The Last Jedi review and see how good is this new Star Wars title! 2. How Good is Star Wars The Last Jedi? 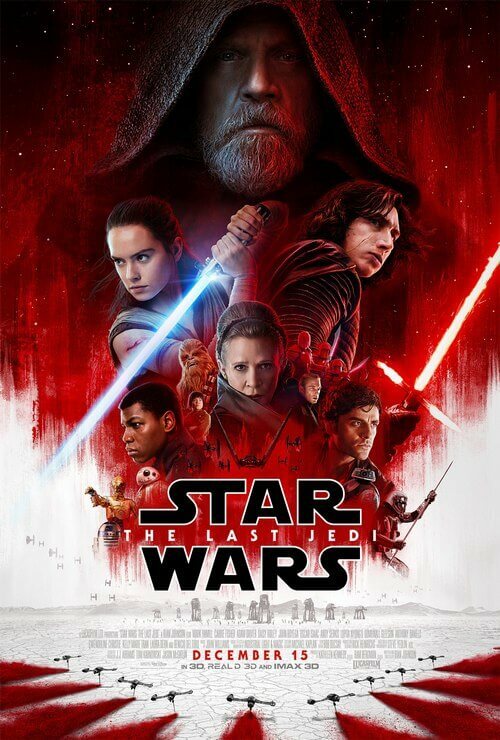 Star Wars The Last Jedi is the middle act of the new Star Wars sequel trilogy directed by Rian Johnson and also the eighth episode of the Star Wars saga (not counting the spinoffs). 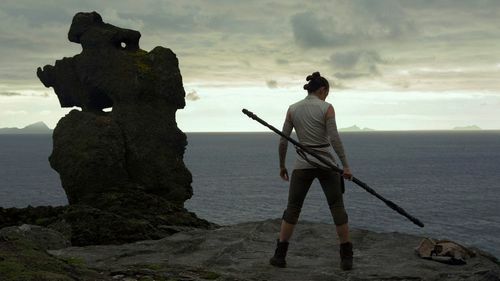 The movie picks off what’s left from Star Wars The Force Awaken in which Rey is under training from Luke Skywalker and hope that it can turn the tide for the Resistance against the First Order and Kylo Ren. As mentioned, the film has received quite a lot of controversial opinions from viewers and Star Wars fans. 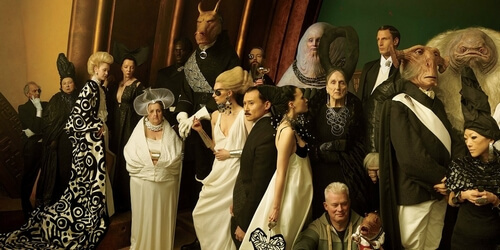 Many people like the film and see it as a fresh-out development for Star Wars story, while many other people considers the film to be a major step-back despite a number of bold decisions. For instance, if we check out the reviews on Rotten Tomatoes, most critics are happy about Star Wars The Last Jedi. However, viewers have different take on the film here with only 56% of them like the film. Naturally, this sort of situation will unnerve many people who want to watch the movie. So before we go into the review, let’s start by saying this: From our perspectives, this Star Wars is definitely NOT a failure. It is a good, enjoyable movie despite certain flaws. If you are Star Wars fans and you have not watched the film, we highly recommend it. And even if you are not Star Wars fans, yet interested in the franchise, we also recommend it. How exactly enjoyable is it? Let’s find out! For starters, it would be a good idea to consider the film’s visual and sound first. Overall, we are happy to say that The Last Jedi’s visual and sound are incredible here. Both are excellently delivered and they totally nailed the sensations in different sections of the film. The visual is absolutely fantastic with many, many gorgeous scenes which we want to say “Wow!” In addition, the action sequences are also fantastic like the epic space battles and especially the lightsaber combats. These lightsaber combats are essential element in Star Wars franchise and no doubt, you will not feel disappointed. Soundtrack is great, although it borrows quite an amount from The Force Awaken. Fortunately, those soundtracks still work fine in this film and help building up emotion from the scenes. Now some of us may complain that there are not much unique things here. We also agree on this. However, we think it is understandable since this is already the eighth title of Star Wars main saga. They seem to try creating new things while still have to keep the old Star Wars images. This is definitely not an easy task especially for a long franchise like Star Wars with extremely long history. That said, if you are not too nit-picky about the visual and sound aspect, they won’t hinder you from enjoying the film. As we mentioned, Star Wars The Last Jedi does feature new directions while still retaining some of the old flashbacks from the previous Star Wars movies. These new directions are bold moves from since it changes the Star Wars progression quite a big deal. Many people may not like such new moves, but personally for us, these changes are nice. And we really want to know how they will develop the story with these changes in the third act. Since the film features many new things, it also includes lots of surprises. 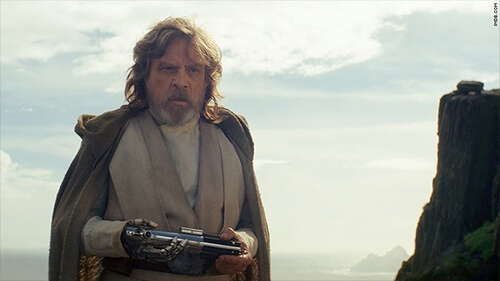 For example, when Rey gives Luke Skywalker his old lightsaber, he throws it behind his back, which totally caught us off-guard. There is also a good reason for that (which we will try to explain in later section). Of course, fans will also expect the film to answer many leftover questions and this film also did just that. Some of the questions like Luke Skywalker’s story after all these years are answered in quite expected ways. In addition, there is deep meaning in the movie, for example the story of heroic figures facing the reality, or the hinting of hope at the end of the film. Yet with all that good things aside, let’s talk about the bad stuffs! While the movie lasts about 2 hours and 30 minutes, it still has pacing problem. There are certain sections which do not feel important or necessary, typically the story of Finn and Rose, and the Casino world arc. When we watched these side stories, we felt like cringing since they were long and did not serve any important purposes. For example the Casino world part: this arc includes many bizarre species (which is kind of… okay-ish?). But other than that, it is no different than our real-life casino. There are certain talks like animals protection which we somewhat appreciate but they do not work out well in this Star Wars movie. Next we have humor element. Like The Force Awaken, Star Wars The Last Jedi also includes humor and funny moments like the “porgs” (luckily they are not annoying). Some jokes are nice, but many others are really vague and do not feel that funny. And then finally, the film opens up more annoying questions and on top of all: plot holes. Of course, many questions are answered throughout the film but then more questions arise like “Who is Supreme Leader Snoke?” He does look creepy but other than that, we don’t know much about the guy’s identity and origin. Also, how can he die? Like he is hyped to be a powerful figure who consider both Kylo Ren and Rey – the two most powerful Force Users to date as child play. And then unexpectedly, he gets killed by Kylo Ren? There is no good explanation for his death (unless they are trying to trick us). There are many questionable plots besides this one but we will try not to mention them here since it will be too long to cover all. Overall in terms of story, Star Wars The Last Jedi did a good job in presenting new directions and it does fresh-out the Star Wars story. 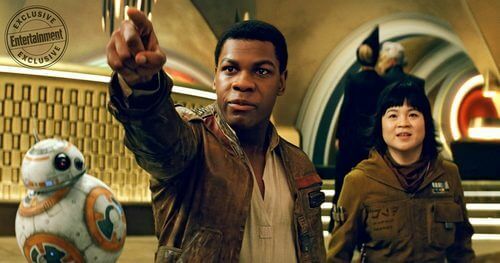 However, the pacing issue (like Finn and Rose side story and Casino stuffs), certain jokes, and many unanswered questions can be a great hindrance, especially for Star Wars enthusiasts. Let’s start with the good things! Star Wars The Last Jedi really did a great job in portraying most prominent characters. Luke Skywalker, Rey, Princess Leia Organa, and Kylo Ren, all are incredible in this film and they really pull us into the film. Luke Skywalker is definitely a magnificent figure here. Luke Skywalker, played by our good ol’ Mark Hamill, shines each time he appears on screen. Although Mark Hamill openly said that he disliked many decisions for the character, we can still agree that he did a fine portrait for Luke. Luke in this movie truly represents the story of a fabled hero facing reality. Despite being revered as the hero who defeated Darth Vader, reality does not do well for him. Hero or not, Luke is still a man with humanoid mentality. 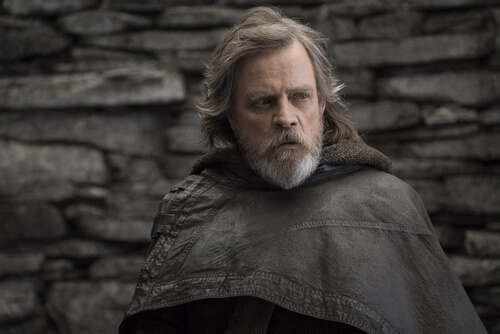 The Luke Skywalker we see in the movie is a damaged, sort of broken man who has bitterness inside him. It gives us quite a good explanation why Luke surprisingly throws his lightsaber when Rey give it to him. It is the very lightsaber owned by his father Anakin Skywalker, a.k.a Darth Vader (a.k.a the one who cut his arm off). Obviously Luke does not want to remember such memory and his throwing act is like forcefully throwing away his hated memory. 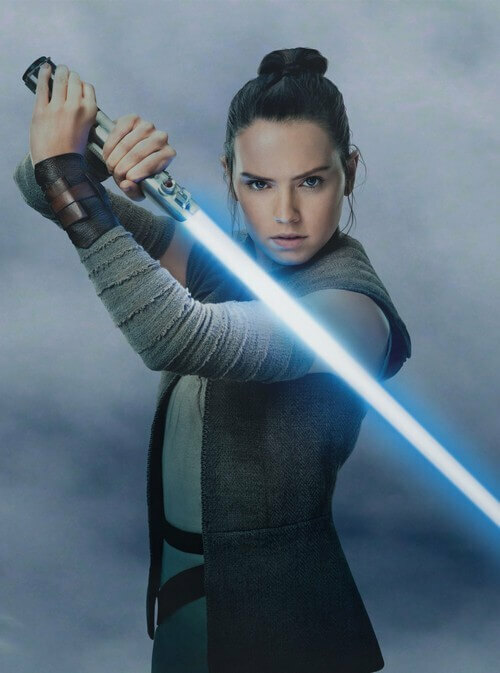 Our main protagonist Rey also nicely represented here through Daisy Ridley. Ridley nicely portrayed the character Rey in both personality and her emotion in many important scenes. She proved herself to be a great choice for Rey character and no doubt we will continue to see her in the last movie of this sequel trilogy. Another great side of Rey and Luke Skywalker is their dynamic. Their training scenes are arguably among the best scenes of the movie where these two characters show the bond of teacher – student relationship. They also show certain development for Luke as a man regaining hope and tell us more about Luke and Rey as human in reality, rather than heroes in legend. Kylo Ren continues to prove himself to be a worthy villain of the sequel. Again, Adam Driver excellently portrayed Ren character and this time, he has a great development ahead of him. Here, Kylo Ren is much deeper of a character than we initially thought. Now he is even more of a broken figure and it is completely unpredictable to guess what will be his next moves. 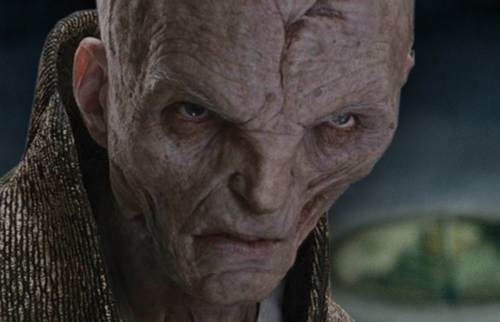 After killing Snoke, there is literally nothing to control him. 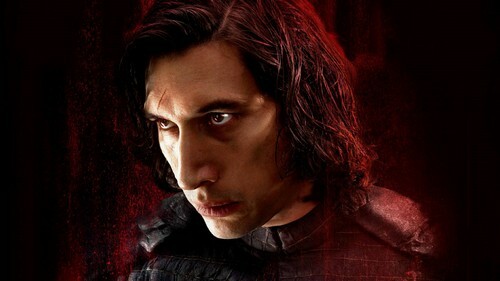 Ren completely gains control of the First Order and who know what a broken villain may be do next. Now we come to Princess Leia part. As we already know her actress – Carrie Fisher already died last year and seeing her in this film can be uneasy for certain fans. 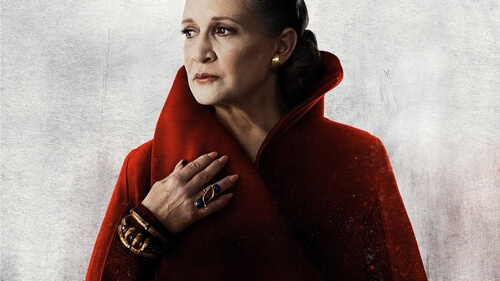 Fortunately, they have done a great tribute for her with Star Wars The Last Jedi. That said; we are kind of curious about how they will bring Princess Leia to the final sequel. It seems that they will use CGI for her character. But how will it turn out? Time will tell. Besides those prominent characters, there are new and side characters featured in the movie. The bad thing is: most of these characters do not have good character development. Let’s take Finn as example, Finn is a great side character and many people like the guy. He also has certain great scenes here but he suffers tremendously from his side story with Rose this time. Another example is DJ played by Benicio Del Toro. DJ is supposed to be an unpredictable type of character. He does not show himself clearly as bad or good; however, honestly DJ did not have good development here. His role does not seem important in the entire story although everything will eventually connect according to Rian Johnson. For us, DJ could have been more interesting character, but sadly, things did not go well for him. For the final verdict of Star Wars The Last Jedi, it is a mixed feeling from our points of view. As mentioned, The Last Jedi is not a bad film. It is enjoyable and it includes new directions for the Star Wars story. Of course not many people will like these new approaches but personally we think it is good change for this 40-year-old franchise. That said; the film’s pacing and uneven characters development really pull it back. If we consider Star Wars The Last Jedi as a sequel to The Force Awaken only then it is a 7.5/10 in our opinion. But for highly anticipated Star Wars fans, the film can be a letdown and it would even score lower than that. Yet even so, we still recommend checking out Star Wars The Last Jedi even if you are not Star Wars fans. The movie is nice and we will find good values here and there. And for now, thank you and stay tune for more news in the future!